Cross stitch is extremely quick and easy to work usually done on even weave fabrics. Since it is one of the oldest stitches in the history of textiles and used world wide for creating patterns and embroidered images it is a familiar and favourite stitch of many hand embroiderers. 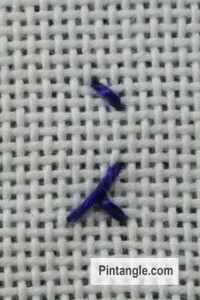 As a stitch, it is simple to work making it ideal as a beginners stitch. However an advanced stitcher should not dismiss it, as this stitch has not survived thousands (literally) of years of textile history without reason. 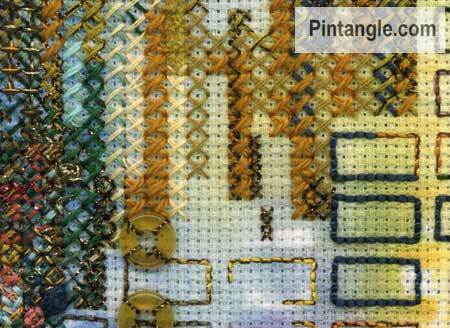 Cross stitch is easily adapted and you can easily mix threads or change the scale of the stitch to create interest. In the sample above I have used a metallic thread along side wool, cotton, silk yarns and donut beads on hand painted Aida cloth. It is still cross stitch on Aida but with a contemporary twist. The same applies to the sample below. This is still Aida cloth but the surface has been hand painted. Also a tip to remember if you are interested in designing your own pieces, cross stitch is worked on a grid which means you can incorporate many of the cross stitch family of stitches to produce a rich and varied surface. You don’t have to limit yourself to the cross stitch family as the fact that cross stitch has such an even structure most Canvas stitches, or needlepoint if you are old school, can be combined with cross stitch. Work cross stitch by first working a row of diagonal straight stitches pointing in one direction and then work a return journey of top diagonals laid in the opposite direction, as illustrated. Although the construction of cross stitch is the same there are different ways of working. For instance cross stitch can be worked individually completing each cross before moving on to the next. This is a method if you are using a hand dyed multicoloured thread. No matter the method used to create the stitch one rule remains constant, and that is, that the top diagonals should always lie in the same direction. Although this rule is sometimes broken by some contemporary embroidery. Half and quarter cross stitch is just that. 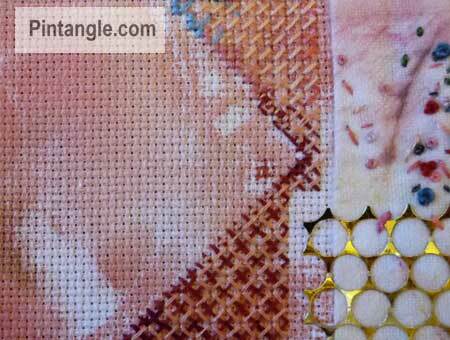 Half the stitch or a quarter of the stitch worked to smooth out the jagged edges of a design. Cross stitch, which is also known as sampler stitch, Berlin stitch and point de marque. You can have Pintangle updates delivered to your inbox by using the subscribe feature in the sidebar. Thank you for sharing,I love the half cross to smooth the edges,stitch maestro! Beautiful examples, Sharon, I agree cross-stitch is versatile and it’s one of my favorite stitches. Thanks for sharing, you are an invaluable resource! I, too, always appreciate everything you share with us. You are the best! I love what you did with the cross-stitches on the painted aida! Your work is always fabulous!